The Jalon Valley or Vall del Pop as it is really called is found a short drive inland from the coast and has become increasingly popular due to its excellent climate. The abundance of vineyards, olive groves and almond trees guarantee some breathtaking countryside in this increasingly popular area. You will often find the Spanish names of towns here replaced by or used in conjunction with their Valencian equivalent. The smallest village (498 inhabitants) in the valley isLliber with quaint side streets and a landscape dominated by vineyards.The village has been traditionally linked to the nearby Jalon, from which it gained its independence. Its economy is based on agriculture, in particular grapes, oranges and almonds, and the traditional "riu-raus” once used for drying raisins can still be seen. 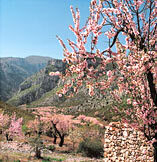 Wine is also produced and marketed under the 'Vall de Xaló' by the wine cooperative, muscatel winesbeing a speciality. Properties here tend to be detached villas or fincas sitting on large plots of land. Currently the minimum size plot on which you can now build in Lliber is 10,000 m2. The town of Jalon is the largest in the Jalon Valley with around 2000 inhabitants and home to the wine cooperative of the region. Over 2 million litres of wine are produced annually and sold all over Spain. Visitors come from all over the area to buy wine and on Saturdays the town is teeming with people coming to the popular flea market set up along the banks of the river Xaló. The town is a thriving community of shops, restaurants and cafés and there are several clubs you can join, among them a hunting club with firing range, a cycling club and several indoor football teams. The town hall organises various cultural activities and as with every Spanish town or village, it has its own fiestas at different times of the year. Just 2 km from Jalón, Alcalali is another small town with a population of about 850 but its popularity is steadily increasing. There are many excellent restaurants here with people coming from all over the region to sample the wonderful variety of food found here. As with Jalon, the residential developments of detached villas are found on the outskirts of town. Originally a Moorish village, Alcalali is traditionally dependent upon agriculture, especially grapes and oranges. The number of foreign residents is increasing however, bringing more facilities and amenities to an otherwise traditional Spanish village. 2 km along from Alcalali you find Parcent, a lovely quiet village with a population of about 600. It is not as busy as Jalon and only has basic shops, yet is very pretty with houses having pots and window boxes full of flowers. The village is located in a green orchard in which almonds, oranges and vines abound. In the words of writer Gabriel Miró, who lived in the village and whose house still provides a reminder of his stay, Parcent is a 'paradise between the mountains'. The economy of the village essentially resides in the growing of almonds and oranges. The famous traditional 'riu-raus' where the raisins were dried can still be seen. Even smaller still is the village of Murla yet it is just a 10 minute drive to Jalon and 30 minutes to the coast, a perfect and idyllic spot for those wanting peaceful countryside and a slow pace of life. On weekends the village´s narrow streets host the ball game known as "pelota valenciana". The villagers take it so seriously that a square in Murla is named after one of their best players. Murla is a village with very limited facilities – one shop and one bar. A weekly market comes to town so locals can buy their fresh produce. 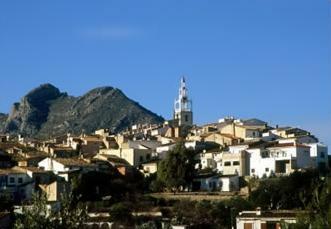 Benichembla has one of the lowest altitudes of the villages in Alicante province. It is situated on level ground at the foot of the Cavall Verd Sierra, next to the Xaló/Gorgos River. Agriculture is dominant here as vines and citrus fruits are grown and grapes are left to dry in the ancient 'riu-raus' (buildings with arches for drying grapes and making raisins). The last village of the Jalon Valley is Castell de Castells,a village with a population of just over 500. It is one of the least known villages of the region, though its natural beauty is certainly worth a visit. Castell is surrounded by mountains and access to it is fairly difficult - which may explain why the village is comparatively unknown. Agriculture is its main economic activity, especially almonds, olives and carob. As more people choose to settle here and what is known as "rural” tourism in Spain is on the increase, the village is gradually adapting itself to offer visitors a wider range of services.